The core idea of this deck is still the same. Winding Constrictor plays very well with energy threats and +1/+1 counters. Cards that overlap with the two themes, such as Bristling Hydra, are especially powerful. This deck gets a lot better with the addition of explore creatures such as Mefolk Branchwalker and Jadelight Ranger, which can be absolutely monstrous follow ups to Winding Constrictor. However, explore effects aren’t the most exciting addition to this deck. That would be Hadana's Climb. This card is spectacular with Walking Ballista and Winding Constrictor, allowing you to add +1/+1 counters every turn and generating additional value with those counters. The other upside to playing Hadana's Climb in this style of deck is that it’s particularly easy to flip, given the density of +1/+1 counter effects in already in the deck. The flipped side, Winged Temple of Orazca, threatens to turn any one of your threats into a lethal, evasive threat. 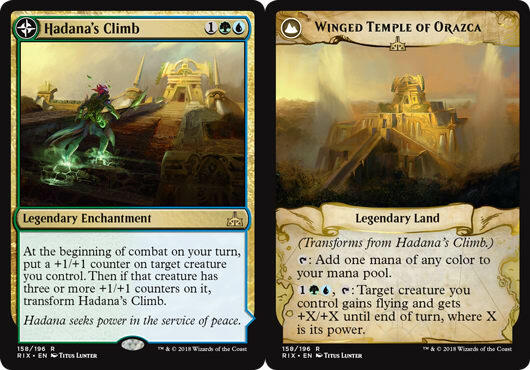 Hadana's Climb is exactly the kind of card this deck needed to replace Nissa, Voice of Zendikar. It gives you another engine to kick the synergy up, you’re happy to let it sit on the board and turn each of your small threats into something that demands your opponent’s attention, and if they let it get out of hand you can just kill them with a huge flier. If you’re looking for a synergistic way to beat down in the new Standard format, it’s hard to go wrong with a giant pile of synergistic cards backed by efficient removal and The Scarab God. Setting aside the incredible card quality, the deck just looks like a blast to play.